← Kickstarter Project Funded -And How! 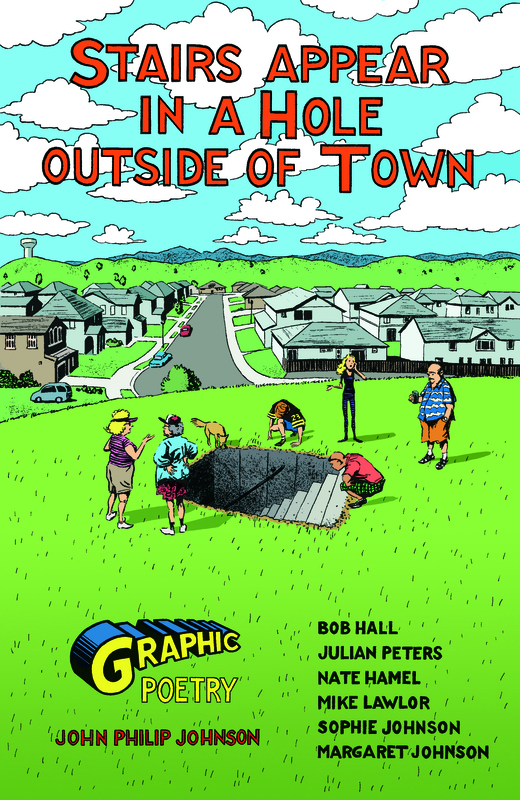 “Stairs Appear in a Hole Outside of Town: Graphic Poetry” now ready! If you’d like to hear a reading of “Stairs Appear in a Hole Outside of Town” the titular poem that I illustrated for the collection, click to this link to the website of Rattle magazine: http://www.rattle.com/poetry/tag/graphic-poetry/ The delivery is spot on, I find, and it’s fun to listen to while following along with the images. This entry was posted in comic book poetry, comics, maryse daniel, Poetry, Poetry Comics and tagged audio sample, graphc poetry, john philip johnson, rattle magazine, stairs appear in a hole outside of town. Bookmark the permalink. 3 Responses to “Stairs Appear in a Hole Outside of Town: Graphic Poetry” now ready! Il me semble que les couleurs…ont du mordant ou du vivant, je ne sais trop comment dire, ce quelque chose de plus qui est accrocheur. j’aime! Thanks for the kind words about my reading of “Stairs Appear…” I love doing it and I loved this poem. Your illustrations are fantastic and I think the 3 of us created something really special, if I do say so myself! Hi, Diane(? ), I don’t usually appreciate other people’s readings of poems that I already know and love, but I really, really liked yours. I thought it was spot on in its rhythm and its emphases, and in its measured expression of the surreal. Almost just the way I heard it in my head!